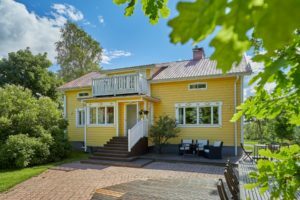 ‘Pois Tieltä!’ offers an event service at the Tonttula estate, approximately 30 minutes from Helsinki, and transports you to the real countryside. It is the ideal place to host a warm family party, business event or any other festive or casual event. 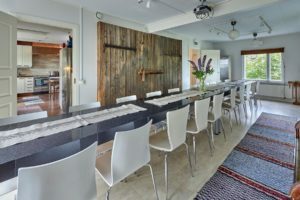 At Tonttula farm, the event service is provided in a genuine farmhouse atmosphere, even though the house has been renovated and equipped with modern conveniences. Flexible event facilities offer a great opportunity to organise bigger celebrations and occasions as well, even for several hundreds of guests. The courtyard is large and pleasant. The terraces continue directly from the outdoor stairs, extending the lounge and serving area. At Tonttula, you can therefore cater to more than 100 people. For more casual events, you can also rent our high-quality sauna facilities. High-quality food is the hallmark of our banquet service. The menu options are designed by experienced chef Mikko Artjoki from Hiidenveden pitomestarit. On the caterers’ webpage you can find examples of menu packages from which you can choose or start building an offering that suits your occasion. See here for example menus, from which you can choose or build a suitable offering for your own occasion. At Tonttula, we are flexible and we always think of the customer’s comfort. ‘Pois Tieltä’ tailors just the right event for you.